Sept. 4th thru Sept. 7th - The 137th New York State Championship. Labor Day Weekend in Albany, NY. $13,000 guaranteed prize fund. 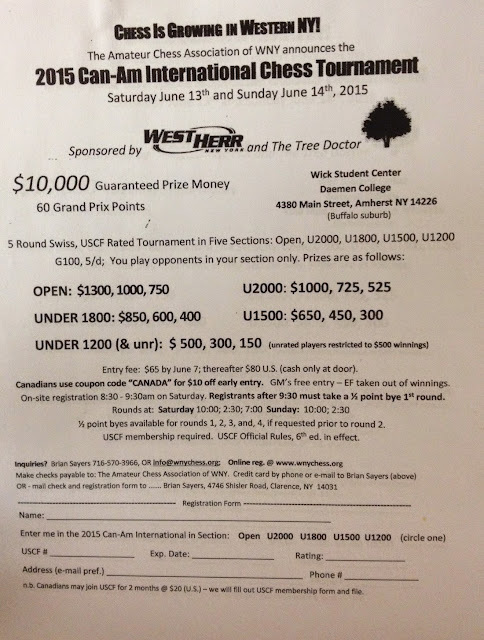 2015 World Open (click for link) chess tournament in Washington, DC. Ken McBride presented a certificate and check to Webster Kehoe for his outstanding performance at the 2nd Annual Community Chess Club Simultaneous Event held in June 2015. The club celebrated with a cake after the ceremony. Nice job Webster! Date: Wednesday, July 1, 2015. We had the pleasure of welcoming back two long-time Community Chess Club members, Pal Urai (left front) and Paul Urai (right middle). Pal played against Michael Butler, and Paul played against Tanush Senthil-Kumar. Date: Wednesday, July 1, 2015. It was great to have Laszlo Tapaszto play again with us this past Wednesday night with the Community Chess Club. Soon, Laszlo will be heading back to Caracas, Venezuela. We are glad that Laszlo chooses to spend his time with us! His opponent for the evening was Eldon Martin. Laszlo won the Venezuelan Chess Championship six times (1964, 1966, 1971, 1983, 1990, and 1995), played at Caracas 1967 (zonal, Miguel Cuéllar won), and represented Venezuela in Chess Olympiads three times (1964, 1988, 1990). Date: Wednesday, July 1, 2015.
who achieved 1st place on the USCF/FIDE-rated board with 9.5 points! 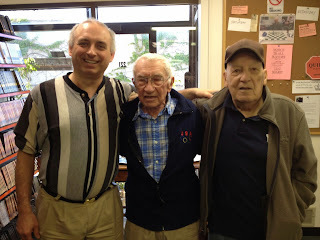 We were very happy to see our friend and chess master Laszlo Tapaszto (right) join us for chess last Wednesday night. At left is Jan Tarwid, his opponent. Laszlo won his game against Jan. Laszlo will be in Rochester for a couple weeks and will be playing chess with us at the Rochester Chess Center. Date: Wednesday, June 24, 2015.
has their wonderful chess magazine online. Please click here to view an issue. Coverage of many Rochester events are included. The online issues are provided by the New York State Chess Association. 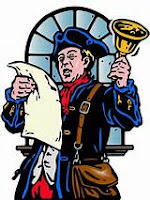 The New York State Chess Association, Inc., America‘s oldest chess organization, is a not for profit organization dedicated to promoting chess in New York State at all levels. As the State Affiliate of the United States Chess Federation, its Directors also serve as USCF Voting Members and Delegates. with 2.5 points each in the Saturday morning Youth tournament! In a 5-minute blitz playoff, Christopher finished in 1st place! The 2015 Can-Am International is taking place this weekend in Buffalo. Ron Lohrman and Ken McBride are there to run the event. Many local Rochester players are participating and the chess van took many players to the event. We all hope all the best for a successful tournament and many future Can-Am in years to come! Details about the event are below (see flyer). 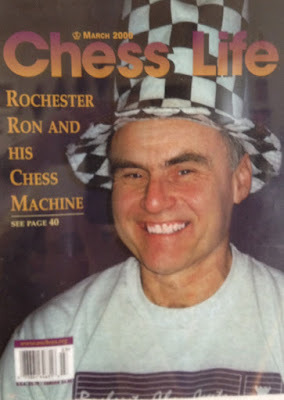 Over 25 years of promoting chess and supporting chess events in Rochester, NY and around the state. Thanks Ron !!!! We appreciate all you do for chess!!!! and a staff of experienced chess teachers. The Chess Center also offers private and group chess lessons for youth and adults. Contact the Chess Center at 585-442-2430 for more information. Television Series - Chess Match ! Now on Youtube! 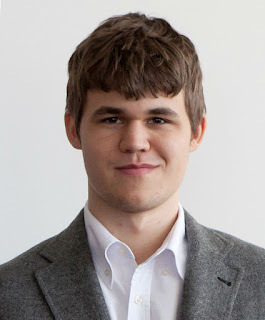 Please click the link below to visit Buffalo's excellent Chess Blog by chess organizer, Michael McDuffie. Please help promote chess by participating in tournaments in Buffalo and across NY state! Another terrific place to find chess tournaments is at the Continental Chess Association web site. For example, coming up this Labor Day weekend in September is the NY State Championship and a huge group of Rochester players will be participating! These tournaments are run by Bill Goichberg and Steve Immitt. You can count on them doing a fantastic job and it is a pleasure to participate in their CCA tournaments. Life-time CCCR member and a fine gentleman, Erich Marchand poses next to his portrait in his chess room. 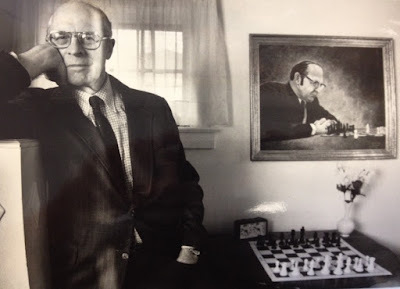 The portrait was donated to the Rochester Chess Center by his wife and is prominently displayed for all visitors to see. CCCR started a Marchand tournament many years ago. The organization of the tournament was later given to the Rochester Chess Center, and we continue to have wonderful Marchand tournaments every year in early spring. Father and Son - Michael & Webster Kehoe share a handshake after their game. The 2nd annual CCCR chess simultaneous took place at the Rochester Chess Center on June 3rd, 2015. A total of 24 players played against our 2014 CCCR champion, Webster Kehoe. Participants and spectators enjoyed a fun evening of chess. The games started around 6:35 pm. The last game finished around 10:15 pm. Prior to the event, the club provided pizza, snacks and beverages for all players and spectators. Some young players had to leave early, so a clock was placed on those games to permit them to finish early. It was a marathon of chess, and many games were very interesting and presented exciting tactical opportunities. Some games were very close right up until the end. Webster's mom and Dad were at the event and Webster's father, Mike Kehoe, played in the event. It was great to have a lot of non-members participating. The special event was sponsored by the Community Chess Club of Rochester, and is one of the club's biggest annual events. We will be having a cake and awards in the near future on a Wednesday night. The date will be announced on the blog and during our regular Wednesday club meeting. Isay Golyak's daughter Milla sent us a photo of her Father playing chess in St. Augustine. We all wish Isay and his wife all the best of luck and good health. Isay Golyak plays chess in St. Augustine Florida - his new home. Registration can be done at the Chess Center. Spectators & Visitors are welcome! and the simultaneous will begin at ~6:35pm. There are still a few seats available, so plan to sign up soon! Save the date for the Annual Chess Center picnic! There are a lot of professionally designed and hobbyist-created game sites on the world-wide-web. Some of these game database sites include millions of chess games. Some sites let players submit their own games for publishing. In the future, the links tab on the main site pages will include more links such as these. At the Chess Center, several types of large chess databases are available for sale. You can also find some chess databases will lots of games for free online. 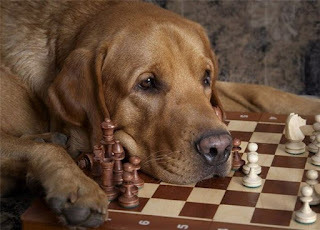 If you are looking for a really big database of games that includes those of the famous Paul Morphy, Rochester players - Matt Slomski, Kenneth Rogoff, Isay Golyak, Igor Nikolayev and Erich Marchand, you can try visiting chessgames.com - This link will take you to Paul Morphy. photographs from the two chess club farewell parties for Isay Golyak. Thanks to Howard Decker for the photos from Saturday's party. Isay and his wife will be moving to Florida in May. Help spread the word... please email your friends to let them know about these two events. Isay Golyak is the nicest chess player in Rochester. 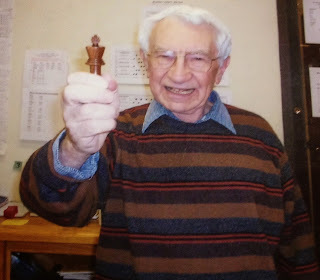 Isay has been a wonderful mentor, friend and chess teacher and he will be missed. 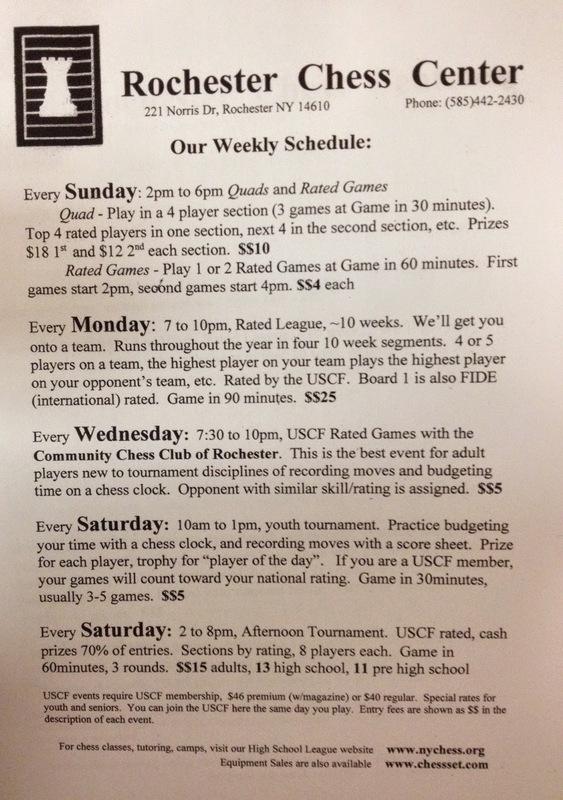 Rochester Chess Center's Monday Night League - Round #1 begins April 5th. For the first round of all leagues, please register between 6-6:45pm, and games will begin at 7:30pm. For all other rounds, games start at 7pm. Great training ground for players starting out in chess up to expert/master level. G/90d5. USCF membership required (can join at site). Run by the Chess Center. $25 for 10 weeks, extra for FIDE-rated games on top board. Run by the Chess Center. Wednesday Night chess with the Community Chess Club of Rochester (CCCR) - every Wednesday night. Single game, relaxed atmosphere. Great training ground for players starting out in chess up to expert/master level. Register between 6:45 and 7:15pm. G/80d5. USCF membership required (can join at site). All ranges of skill levels take part. CCCR members $3 entry fee; $5 non-members. Run by volunteer staff of CCCR. 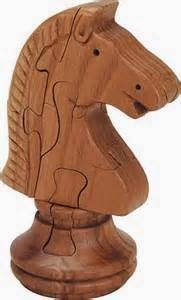 Rochester Chess Center's Saturday Morning Kids Tournament - every Saturday from 10am-1pm. A wonderful introduction to chess. Girls and boys ages 6-12 play 3-4 chess games and receive chess instruction. G/30d5. $5 entry fee. USCF membership is optional. Run by the Chess Center. Rochester Chess Center's Saturday Afternoon Adult Tournament - every Saturday from 2pm-8pm. Highly competitive, cash prizes. Some of the strongest chess players in the area compete every week. If you really want to test your chess skill and endurance, this three-round chess tournament is a good choice. G/60d5. USCF membership required (can join at site). $15 entry fee; less for HS, pre-HS and Chess Center members. Run by the Chess Center. 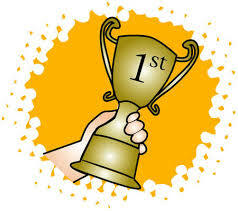 The above tournament link includes photographs showing results and prizes for every section. Note: We expect seats for this event to fill up quickly. or play regular USCF-rated games (if a USCF member) in one of our other playing rooms. Welcome! The information provided here is intended to alert chess players to events specifically for the Community Chess Club affiliate and general information. The Rochester Chess Center affiliate is a separate entity, but information is generally included here to include their tournaments and activities too. The editor hopes that every post on this site/blog is helpful and promotes chess and chess-related activities in a very positive way. Leave messages for the editor at the number or address above and the Chess Center staff will forward messages. Requests for content removal will be carried out as soon as possible. Content may be edited or completely removed at any time. Make copies of something if you like it, because this is not an archive. 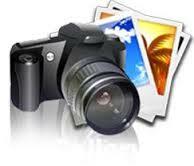 Photos that are removed from the site/blog to keep space utilization in check generally remain on the Microsoft cloud. Our club is a safe environment for chess. 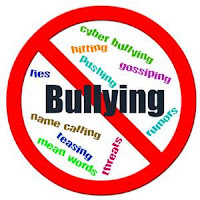 Bullying, harassment or stalking either in-person or cyber-bullying (email or online elsewhere) is not only wrong, it's illegal. In New York State, cyber-bullying is a criminal offence. Stalking is unwanted or obsessive attention by an individual or group of individuals toward another person. Stalking behaviors are related to harassment and intimidation and may include monitoring, sending letters by US mail or email. In New York State, stalking is a criminal offense. Nice to see the return of Laszlo Tapasto to the CCCR. In the photo showing his game with Jan Tarwid you can see myself and Mike Runnells doing battle. Mike was giving me a proper hiding, but fortunately for me his time trouble saved the day for me. I've done a brief annotation of the game here.